The young ringtail who visited last time has been given a name: Batgirl. She is brave and athletic, and when her name was mentioned to her, she responded with an energetic leap onto a nearby branch, as if saying that she likes the name. Batgirl (who is probably the daughter of Tilda and Wasabi) seems to like humans; she tends to come closer when humans are around, whereas other ringtails usually retreat, but she doesn't accept food. It's probably good that a young ringtail sticks to natural foods anyway. Wasabi still hasn't visited. He has been known to go away for months at a time, so there's theoretically nothing to worry about, however I'd really like to know that he's alright. Even under normal circumstances I tend to worry when a possum hasn't visited in a while because there are so many hazards in the area. 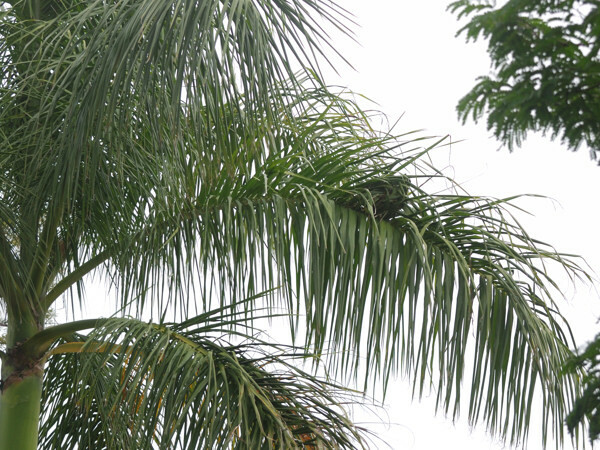 This tendency to worry hasn't been helped when recently the grandson of a neighbour spotted a ringtail (possibly Tilda) on the power line feeding my house. His immediate response was to yell out "Shoot it! Shoot it!". Fortunately this is the suburbs and there's no real danger of anyone actually shooting a possum, but nevertheless it shows the sort of attitudes that some people have. The neighbour in question, by the way, appears to have a hatred of trees bordering on a phobia, and he was genuinely puzzled about why I wanted to rescue Cocoa when she was attacked (fatally, at it turned out) by his dog in 2007. So you could say that we don't see eye-to-eye on some things. 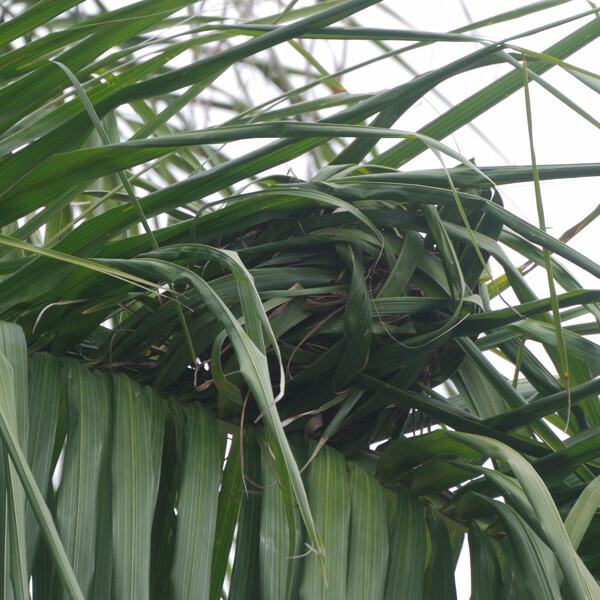 Meanwhile, I've seen another ringtail possum drey (at least I'm fairly sure that's what it is) in a neighbour's palm tree. Fortunately, this belongs to a different neighbour, who doesn't mind possums. This drey looks much more solidly constructed than the previous one and it appeared undamaged after recent heavy rain. I'm not sure who lives in it. Amiri hasn't been seen for nearly a week. When last seen he had an unpleasant wound on each thigh, so I'm hoping he'll come back soon so he can get treatment if he requires it. The wounds are a little weird in that they look like bite wounds, but are symmetrically located high up on each thigh. Oz is growing up fast, and continues to be a bold exploring possum. Recently he left the nestbox an hour earlier than Kiki, which is unusual for a young possum. He has also even come into the house on his own. Finally, here's a picture of Kiki and Oz from a few weeks ago. It's a little out of date, but I thought it was worth sharing. Sorry, was just in the middle of sending you a message when our internet connection died. So will try and write it again in case it didn't get through - can you delete this if it's a duplicate or triplicate?! Thank you for the update. Batgirl indeed looks fearless! It's about a young ringtail. You have a lot more experience than us with ringtails, could we ask your thoughts re this one's age? I've been looking at the photos on the hotlyspiced.com site and it's difficult to make a good estimate. 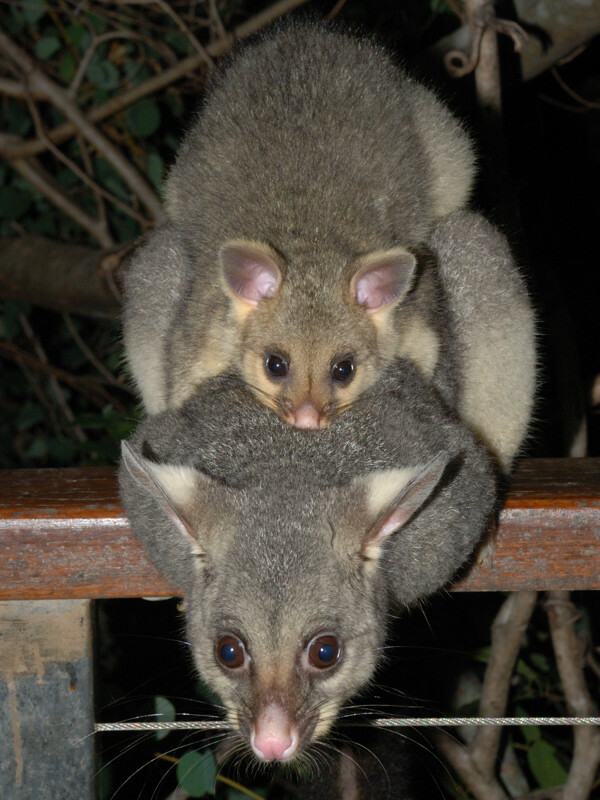 The pictures of ringtails on the Possum TV blog don't give a good idea of how big they are, but they're very small animals compared to brushtails and it's easy to underestimate their age. Often I've seen a ringtail in a tree and thought it was a baby, then found it to be a full-grown adult when it approached closer. 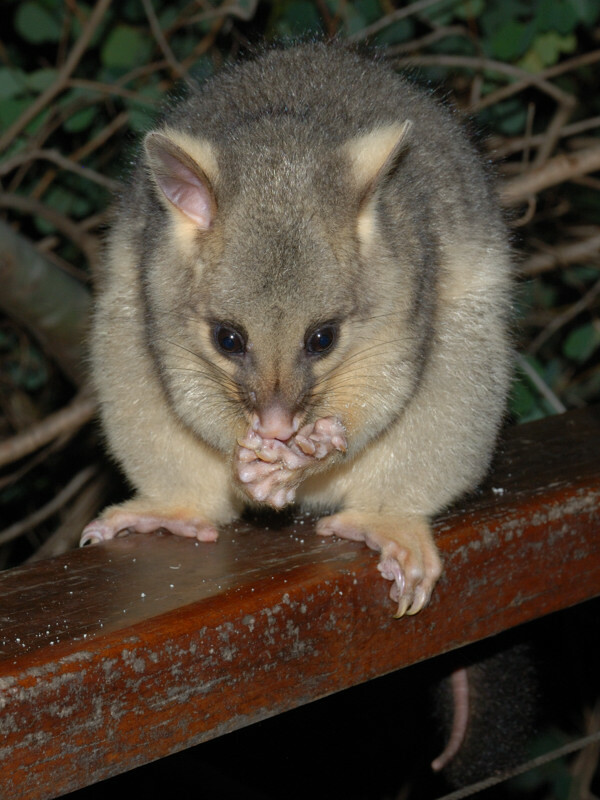 Wasabi, for instance, probably only weighs 800-900 g and might not look much bigger that Archie's possum when photographed from the right angle. On the other hand, this is a different variety of ringtail to what I'm used to. 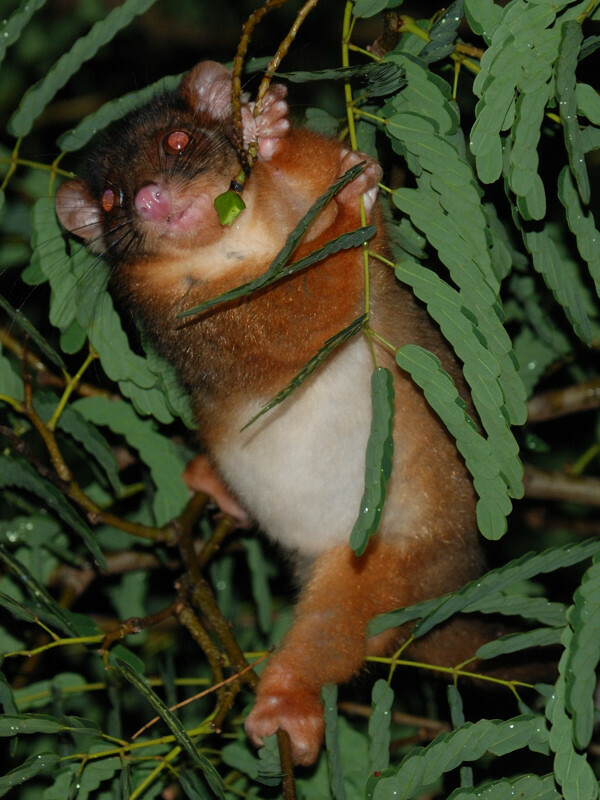 Here in QLD the ringtails are very red, but in Southern states they're much more grey in colour like this one. Usually possums are bigger the further South you go. I suppose I would say that the possum looks young, but not "very" young, if that's any help. I could imagine a possum of this size being able to survive on its own and no longer "needing" its mother. I've seen smaller ones foraging and sometimes sleeping on their own, and Wasabi would have been younger than this when he was orphaned. By the way, I should add that last night Wasabi did come back, healthy and hungry. I put up a blog post soon after, but it looks like blogger is running a little slow at the moment. Some of your posts from three days ago are only just appearing now. Thank you - Blogger is being very weird at the moment, we agree! That's good to know, re the little ringtail. We just hope it gets home eventually. Wonderful news about Wasabi. Let's hope Amiri turns up soon.